I hate being a come day go day blogger but I seem to have lost the rhythem of doing stuff on a regular basis.I'll call it laziness but I haven't been lazy . I'm doing crochet and knitting to put in my christmas presents . Those crochet ripple blankets take a long time to make but I hope whoever receives them will feel wrapped in love . They are not a cheap gift to make so I'm hoping they will be well received . The throw on my settee is a present to myself . It's really luxurios . It's chenille , soft and silky , pearl beads on the fringing . I bought it from Laura Ashley , 30% off it's original price and I love it . It's quitebig , It's folded in four here . A fair amount of cooking done today , Chicken and veg, soup, at least four portions to go in the freezer . Chicken curry , two portions for the freezer . Beetroot , and chicken drumsticks , some for my dinner tonight with salad and some left over . I bought a pack of chicken portions yesterday , there were 15 pieces in the pack so that is the reason for the cooking and I shall have meals just for the taking and defrosting . I have to bake a coconut cake this afternoon in an exchange for Bramley apples . My tree didn't produce any this year . I have also been given blackberries so they must be cooked also .. I have been making a pretty patchwork top , it's ready for the batting and backing . That is from a jelly roll . I'm always surprised how much there is on a jelly roll .I am hand quilting a large zig zag quilt . I saw one on the blog of http://cluckclucksew.com , I have lots of scraps so it was a good project for using some . 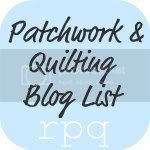 Cluckclucksew has some fabulous quilts on her blog - thanks for pointing me in her direction, I have enjoyed looking at the pictures. Too busy to sew any myself right now though. This HandMade Christmas Thing is taking over a bit round here!